Tam Vu, assistant professor of computer science and engineering, sat down with The Denver Post to talk about Pokemon Go and how players can keep their data and personal information safe. On Friday, May 13, 24 teams participated in the Spring 2016 Senior Design Competition and Open House. Nearly 100 students from civil engineering, computer science, electrical engineering, mechanical engineering, and the College of Architecture and Planning showcased their capstone projects in the North Classroom Atrium. Projects ranged from the design of a new museum for the Denver Police Department to a solar powered boat. Teams presented to a panel of eight industry judges, competing for cash prizes. The event also hosted a group of 60 eighth grade students from Clyde Miller K-8 in Aurora. The students spent an hour meeting with the teams, asking questions about each project, and working on a scavenger hunt. The Senior Design event is made possible each semester by donors Donald and Karen White. SANTA CLARA, Calif.–(BUSINESS WIRE)–Nexenta, the global leader in Open Source-driven Software-Defined Storage (OpenSDS), today announced a new Higher Education Program that encourages partnerships with universities to develop technical curricula to better prepare undergrad STEM students for the workforce. By building on the solid foundation of software engineering and computer science curricula, and adding advanced courses with both academic value and substantial “real world” applicability, Nexenta and partner universities will provide graduates with exceptional tools as they enter the workplace. The program’s charter member is the Department of Computer Science and Engineering in the College of Engineering and Applied Science at the University of Colorado (CU) Denver, which is expected to be closely followed by San Jose State University. According to the U.S. Department of Labor, the job outlook (2012-2022) for software developers is expected to grow 22 percent, well above the 11 percent growth for all categories. One of the factors driving this demand for software talent is the wider deployment of software-defined solutions as the virtualization and automation of the entire operating environment—server, storage and network—is more readily adopted by enterprises. Initially, CU Denver will offer an advanced storage technology-focused course for exceptional undergraduate students and graduate students, entitled “Computer Storage Systems,” that will be taught by Doug McCallum, former storage engineer with Oracle and Sun Microsystems, in the spring semester, which begins Jan. 19, 2016. Courses to be offered by San Jose State University are currently under development. The fourth annual College of Engineering and Applied Science Year-End Celebration took place on Friday, May 15, at Ninth Street Park on the Auraria Campus. Nearly 200 people from the college community attended the event and enjoyed delicious food, a photobooth, badminton, a visit from Milo the Lynx, and a lively awards ceremony. Check out the slideshow below, and mark your calendars for May 13, 2016 for next year’s Celebration. Sarah Mandos, program assistant for the Department of Computer Science and Engineering has been named the 2015 College of Engineering and Applied Science Outstanding Staff. The award, which includes a cash prize as well as a commemorative plaque, will be presented at the college Year-End Celebration on May 15. As the winner of this year’s award, Sarah will be appointed to serve on the selection committee for next year’s Outstanding Staff award. 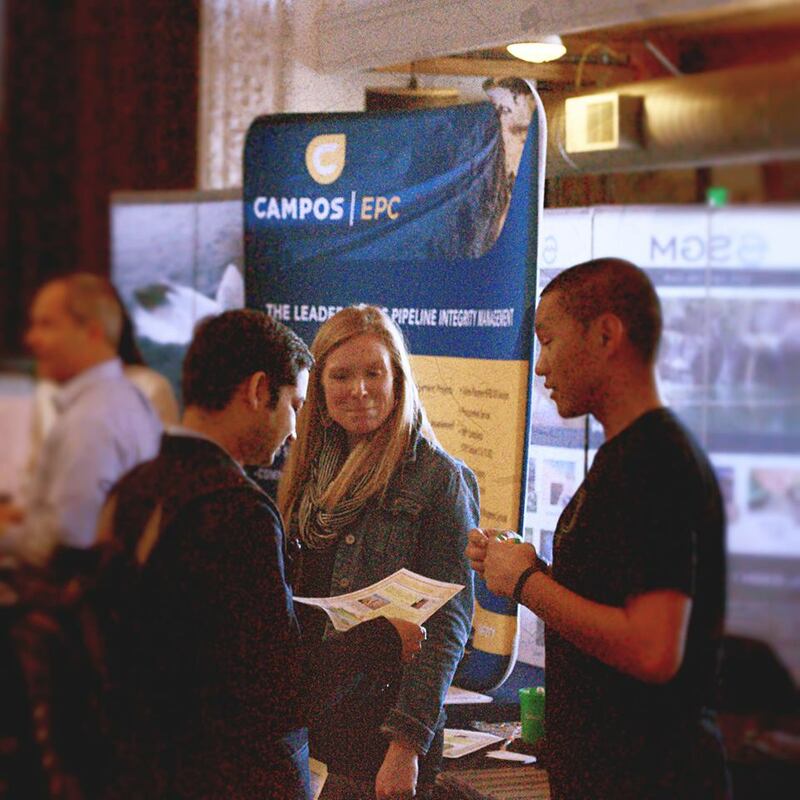 On February 5, the Tivoli Turnhalle buzzed with enthusiastic engineering students on the hunt for internships and jobs. 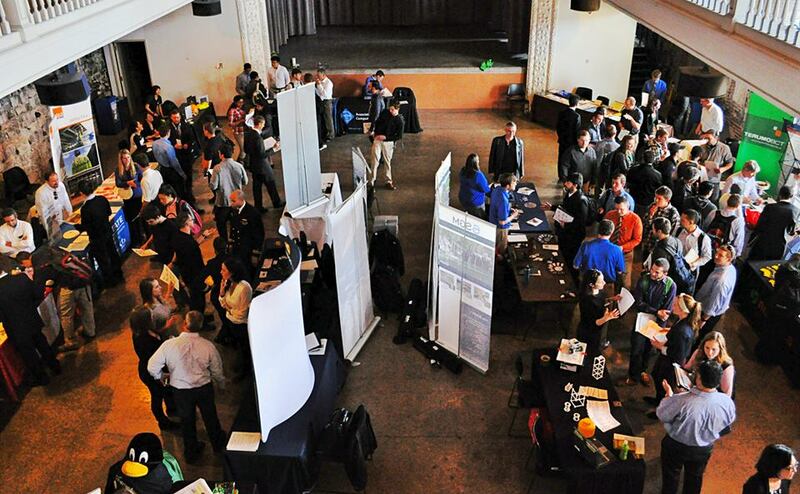 Twenty-one companies attended the third annual Engineering Job and Internship Fair, which drew almost 300 students. The CU Denver student chapters of the Society for Women Engineers (SWE) and Tau Beta Pi sponsored the event, along with the university Career Center and Experiential Learning Center. David Chau, a 2014 graduate from the computer science program, attended with his current employer, ReadyTalk. “It’s definitely different being on this side of things and seeing students that I knew last year come through here,” he said. “We talked to at least 15 solid candidates today…there are definitely students who are ready.” ReadyTalk has participated in all three engineering job and internship fairs—Chau landed an internship with the company during his junior year at the 2013 event. Students attending the fair appreciated the variety of companies on hand and the opportunity to network with employers who were actively seeing engineering professionals. Nexenta, a company that develops software defined storage solutions, also has been present at all three fairs. Eric Ray, director of platform engineering with Nexenta, was impressed with the number of viable candidates, and he stressed the importance of events like the job fair to build relationships between companies, CU Denver, and the College of Engineering and Applied Science. Jason Lewis, a computer science professor at CU Denver, knows once a story makes its way online, it becomes virtually impossible to remove. A recent document from Intel describes the features of its collaboration with the department of Computer Science and Engineering at University of Colorado Denver. The Intel® Software Academic Program supports parallelization studies with the help of Professor and Chair Dr. Gita Alaghband. Access to these sophisticated tools are integral to successful careers for students and new discoveries for researchers in the field.